For the past 3 years, the CW’s ever growing TV DC Universe has been pretty easy to follow. For the TV seasons starting in 2012 and 2013, there was only Arrow to keep track of, and even once The Flash was added to the mix, the two shows’ episodes lined up pretty perfectly, the crossover happening at episode 8 for both series and every other episode lining up well enough that a rewatch just requires alternating evenly. Technically, the 6 episode animated Vixen miniseries is in there, too, but it’s been stated to fit snugly between episodes 15 and 16 of Arrow’s third season. But as the network’s roster of DC shows has grown, complications have arisen in the timeline of events between shows. 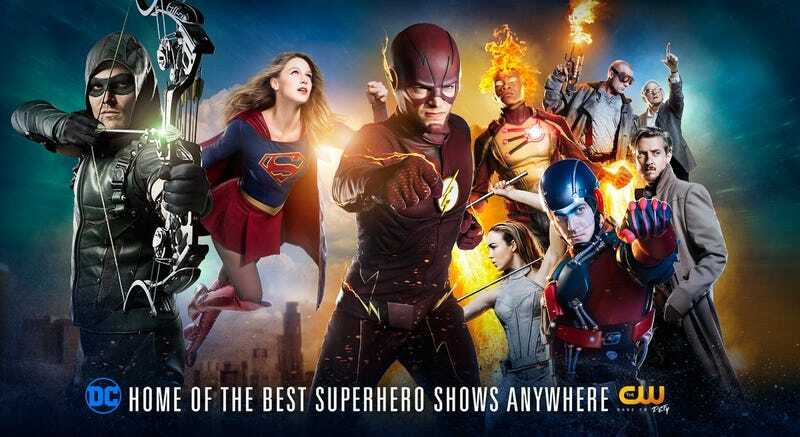 Heading into the 2016 season, the CW will now have Supergirl, The Flash, Arrow, and Legends of Tomorrow; 4 shows across 4 nights (plus a second Vixen miniseries). Now, all of these shows will be airing concurently, on the same channel, and as of right now it appears they will all have the same 23 episode order, which in the end will make things very easy. But this last year? They didn’t have any of those luxuries. Some shows had less episodes, one of them was on a different channel, and at one point real life events led to the switching around of episode air dates. So if you’re anything like me, and you like rewatching shows over the summer but want the continuity to line up, you’re looking at kind of a mess. -Bolded means they tie in to other shows. -You can watch this at whatever pace you want, but I kind of like the idea of watching weekly, as it gets me through the summer better if I pace myself. In either case, each row represents essentially a suggested batch, so if you wanted to go weekly, this would be the best way to do it. -The first half of the year before the Winter Break was pretty easy. Supergirl technically is on Mondays so for most of the year she leads the batches, but she was introduced after the other shows, so it made sense to get back into the others first, then make her pilot a little special by building up to it. -The back half of the year was much more difficult and it all comes down to Supergirl having 3 less episodes than everyone, but crossing over with Flash at episode 18. This meant that if you wanted all the finales to happen in the same batch, you’d need to get through 6 episodes of Flash and Arrow at the same time as 3 episodes of Supergirl to do it. Legends also made this difficult, because they have 3 more episodes than anyone, so they needed to double up throughout the year. Legends was the easiest, as their time travel plot didn’t affect the other shows at all, they could simply double up whenever it felt appropriate to do so (each of the doubles I have here are essentially two parters that go well together). Flash and Arrow were just a little tougher, but the doubled up episodes work pretty well if you treat them as two parters also. -If you want to be really technical, the Flash/Supergirl crossover is episode 18 for both and should really have the first about 5 minutes of Flash, then jump to Supergirl for her whole episode, then back to Flash for the rest. But I’m not even gonna try to do that. I think this works best; you get an idea of Flash going somewhere hinted at but not explained, then when you watch the Supergirl episode you see what happened. -Unfortunately, no amount of continuity threading can save the fact that all these shows had some problems this year. Supergirl’s romantic plotlines got bad right in the middle of the year to the point where they felt like they were scenes from a totally different show that got spliced in somehow. Legends’ romance between Ray and Kendra was terrible too. Arrow flat out had a whole bad year (mostly the second half, but enough to write the whole thing off). And Flash has some major flaws with the A-plot and big reveals that don’t make quite so much sense in the foreshadowing and a couple really bad decisions on the part of the leads. - *Spoilers for Arrow* And yeah, all episodes of Arrow are optional, save episode 8, the second half of the crossover with Flash. What can I say, it was a bad year, and watching it would really just drag the rest of them down. Episodes 5 and 6 are useful for setting up Legends, but I’m not convinced they’re necessary. Episode 15 has Vixen, which makes parts of it worth watching. Episode 17 was all about Bug Eyed Bandit and had robot bee constructicons, so it was actually delightful. If you had to watch a truncated version of the season, I’d suggest 1-9, then skipping forward to episode 20 to finish the rest. Felicity’s plot in the wheelchair went entirely nowhere, the section of the season where Damien Darhk lost his powers went entirely nowhere; just pretend that Laurel got shot up in the car instead of Felicity and then she died and you can complete the season without the slogging middle. -I’d suggest individual episodes for skipping on the other shows, but unfortunately their worst parts are threads that show up piece by piece in most episodes and can’t easily be removed by a simple skip. -Lastly, the second Vixen miniseries will fit in here somewhere, but where is currently unknown. What we know for sure is that certain Legends cast member make appearances, as does Laurel Lance. I estimate it will probably take place during the Winter Break before Legends kicks off, as the Legends go time traveling in their pilot and aren’t around at any other point. So there you have it, a confusingly structured couple of crossover seasons made simple for rewatches or catching up for the next season.